These four 3mm Society castings took about an hour to complete. 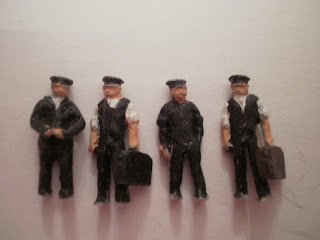 Cleaning of a small amount of flash before undercoating, then letting it dry before applying the colour to these railway figures in dark clothing with white shirts. The flesh colour is by Humbrol and seemed to be the longest to dry. These additions to a platform scene seem to take so much time but are a necessity to complete a scene.